Publication of a research article can be a defining moment in a researcher’s career. However, the steps involved in turning an initial research question into a published article can be a long and arduous journey. To aid in this process, Professional Writing in Kinesiology and Sports Medicine was developed to serve as a comprehensive writing guide for research professionals and students who are looking to improve their academic writing skills. Dr. Mark Knoblauch and his 15 contributors developed Professional Writing in Kinesiology and Sports Medicine to focus around the area of manuscript development and presentation, while also including chapters that outline the foundational concepts of professional writing, developing a research grant, and the journal selection process. Each chapter is written by content experts who bring a wealth of experience not only from their own academic writing but also from having spent countless hours helping students become better, more effective writers. Many textbooks have been written that focus on development of the research manuscript itself, but what sets Professional Writing in Kinesiology and Sports Medicine apart is that it includes so much more to aid writers in their process. 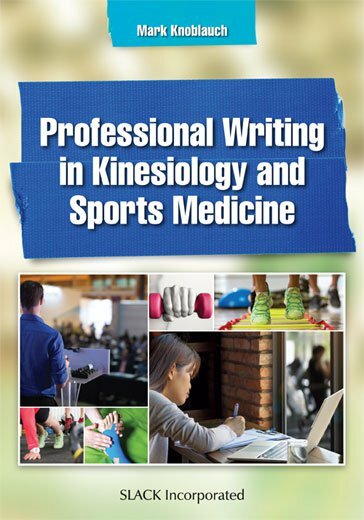 Professional Writing in Kinesiology and Sports Medicine covers those topics and more, with the intent of providing a thorough, practical writing guide that spans the breadth of the research manuscript development, writing, and presentation process. Throughout the textbook, sample writings and cases relevant to the fields of kinesiology and sports medicine are used to provide the reader relevant, applicable examples to help improve their own writing. of Medicine, where his research focus was on skeletal muscle damage and signaling mechanisms. SWATA Free Communication and Research Committee.